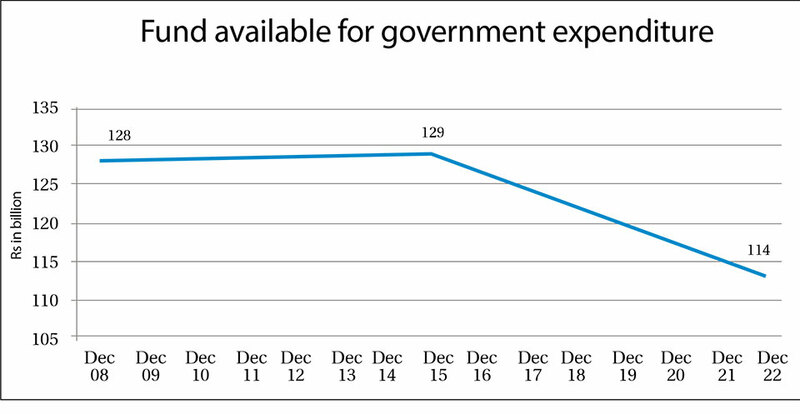 KATHMANDU, Jan 2: With a sluggish revenue collection, the government had only Rs 114 billion in its vault in the third week of December, the lowest in this fiscal year so far, according to the Ministry of Finance. The government officials are worried with limited cash in its vault but they are hoping a rebound in revenue collection by mid-January, the date when businesses have to post the remaining income tax of the last fiscal year and submit 40 percent of their projected tax for the current fiscal year. The shrinking of cash in the government’s vault from Rs 142 billion in the first week of December was because the government spent a significant amount including Rs 17 billion in development works, while no sizable growth in revenue collection occurred in this period, according to the Ministry of Finance. One thing that the government can count on at the moment is collecting revenues through other sources such as internal borrowing. However, this option is also limited as the government has already borrowed Rs 109 billion out of the budgetary target of Rs 145 billion and has invited additional development bond of Rs 5 billion from the market recently. The revenue collection was Rs 264.81 billion by Thursday, merely 36 percent of the target for this year. “We do not need to worry on this as it will be recovered by income tax collection by the end of the second quarter or by mid-January,” said Dhungana. It is obvious that the government has limited cash in its reserve because it has so far released a total of Rs 150 billion to the local units in two tranches including the latest one released on October 18. Likewise, the government has to reimburse at least Rs 7.14 billion to all provinces as allocated in the budget apart from some more money for infrastructure development of the provincial governments and parliaments. This does not mean that the pressure was not expected as budget was designed for the first time this year according to the federal structure. In any case, due emphasis was not given to cope with the new scenario in revenue collection. 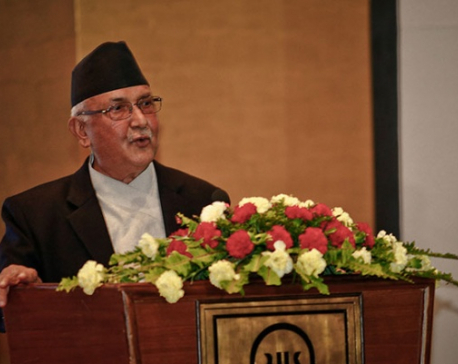 “With the budget and programs in the federal structure, it was pretty clear that the government faces cash crunch,” said former finance secretary Shant Raj Subedi, adding that the only choice the government has is to boost revenue collection and be efficient in VAT compliance, among others. The pressure on the government’s vault was expected but this could have been improved had the government expedited development works on time and changed the previous trend of concentrating spending in the last few months. The sluggish development works is not a new thing the government is coping with. The government has only spent Rs 37 billion or only 11 percent out of the total allocation, as of Thursday’s statistics. Government’s failure to spend on time has also created shortage of lendable cash in the banks. The borrowers have been the sufferers as deposits have slowed at banks and interests rates have gone up.